Unless you have access to multiple ovens, only a very large turkey will do when you’ve got a crowd coming to dinner. But finding a container large enough to brine a gargantuan bird can be tricky, and turning the bird in the oven (our usual method for evenly cooked meat) can be tricky. We wanted the Norman Rockwell picture of perfection: a crisp, mahogany skin wrapped around tender, moist meat. And it had to be easy to prepare in a real home kitchen. We chose a Butterball turkey, which has already been brined for juicy flavor (a kosher bird, which has been salted, works well, too). A combination of high and low heat produced a tender, juicy bird with deeply browned skin. We boosted the savory flavor with the addition of onion, carrot, and celery, and a quartered lemon added bright, clean flavor. After roasting, we allowed the turkey to rest so the juices could redistribute. If you are reluctant to rotate the turkey, skip the step of lining the V-rack with foil and roast the bird breast side up for the full time. Serve with Make-Ahead Turkey Gravy (recipe follows). Adjust oven rack to lowest position. Heat oven to 425 F. Line large V-rack with heavy-duty foil and poke several holes in foil. Set V-rack in large roasting pan and spray foil with vegetable oil spray. Toss half of onions, carrots, celery, lemon, and thyme with 1 tablespoon melted butter in medium bowl and place inside turkey. Tie legs together with kitchen twine and tuck wings behind back. Scatter remaining vegetables into roasting pan. Pour 1 cup water over vegetable mixture. Brush turkey breast with 2 tablespoons melted butter, then sprinkle with half of salt and half of pepper. Place turkey, breast side down, on V-rack. Brush with remaining 2 tablespoons melted butter and sprinkle with remaining salt and pepper. Roast turkey for 1 hour. Remove pan from oven; baste with juices from pan. Using dish towel or 2 large wads of paper towels, rotate turkey breast side up. If liquid in pan has totally evaporated, add another 1/2 cup water. Lower oven temperature to 325 degrees. Return turkey to oven and continue to roast until breast registers 160 F and thighs register 175 F, about 2 hours longer. Remove turkey from oven. Gently tip turkey up so that any accumulated juices in cavity run into roasting pan. Transfer turkey to carving board. Let rest, uncovered, for 35 to 40 minutes. Carve turkey and serve. 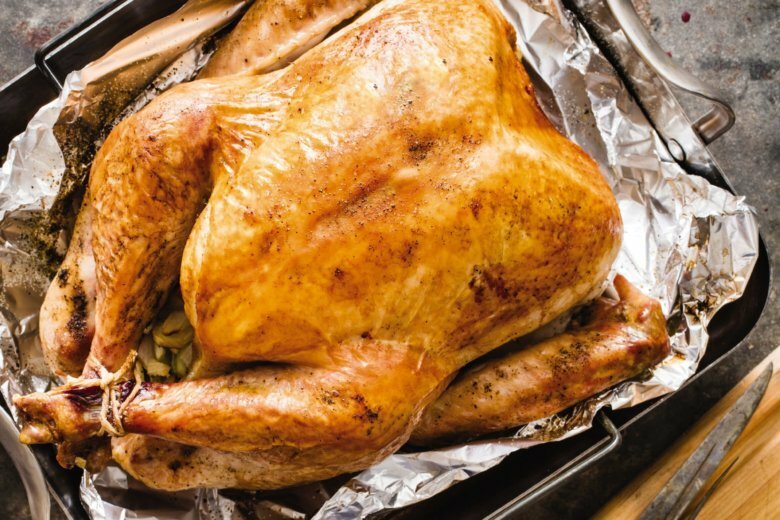 You can’t serve turkey without gravy (and if you ask us, the same goes for mashed potatoes and stuffing, too), but this key part of any holiday feast is often left to the last minute, frantically cobbled together once the bird emerges from the oven. Our make-ahead gravy relieves some of the stress of holiday hosting and even boasts bigger turkey flavor than your typical gravy recipe. Good gravy comes from good stock, so we started by roasting turkey parts with chopped carrots, celery, onions, and garlic. Once the meat was deeply browned and the vegetables caramelized, we transferred everything to a Dutch oven. Chicken broth and white wine plus some sprigs of thyme promised flavorful, savory complexity. Following a lengthy simmer, we strained out the solids and proceeded with our gravy making (though the stock can be refrigerated or frozen for later use). We used the stock’s fat to build a roux, browning a cup of flour in the heated fat before whisking in the stock. The finished gravy boasted all the body of a traditional preparation, but it was ready with time to spare and offered incredible meaty depth. If you wish to make this gravy at the same time as your turkey, you may add the giblets and neck along with the thighs or wings. Discard the strong-tasting liver before using the giblets. For more flavor, after roasting the turkey, skim the drippings from the pan and slowly add them to the gravy (tasting as you go so the gravy does not become overly salty). Adjust oven rack to middle position and heat oven to 450 F. Toss thighs; giblets, if using; carrots; celery; onions; and garlic together in large roasting pan and spray with vegetable oil spray. Roast, stirring occasionally, until well browned, 1 1/2 to 1 3/4 hours. Transfer contents of roasting pan to Dutch oven. Add broth, wine, and thyme sprigs and bring to boil, skimming as needed. Reduce to gentle simmer and cook until broth is brown and flavorful and measures about 8 cups when strained, about 1 1/2 hours. Strain broth through fine-mesh strainer into large container, pressing on solids to extract as much liquid as possible; discard solids. Let strained turkey broth settle (if necessary), then spoon off and reserve 1/2 cup of fat that has risen to top (add butter as needed if short on turkey fat). Heat fat in Dutch oven over medium-high heat until bubbling. Whisk in flour and cook, whisking constantly, until well browned, 3 to 7 minutes. Slowly whisk in turkey broth and bring to boil. Reduce to simmer and cook until gravy is very thick, 10 to 15 minutes. Add defatted drippings, if using, to taste, then season with salt and pepper to taste, and serve. Nutrition information per serving of turkey: 567 calories; 287 calories from fat; 32 g fat (10 g saturated; 0 g trans fats); 215 mg cholesterol; 500 mg sodium; 3 g carbohydrate; 1 g fiber; 1 g sugar; 66 g protein. Nutrition information per serving of gravy: 92 calories; 39 calories from fat; 4 g fat (1 g saturated; 0 g trans fats); 4 mg cholesterol; 69 mg sodium; 7 g carbohydrate; 1 g fiber; 1 g sugar; 2 g protein.